The China Dragon with a crown above enclosed within a laurel wreath. Below is the inscription 1st Bn The Royal Berkshire Regiment 1956. The 49th Foot was raised in 1743 as Colonel Edward Trelawny's Regiment of Foot. In 1751 the regiment was numbered 49 in the infantry's order of precedence. It received its territorial association with Hertfordshire in 1782. In 1816, the regiment was renamed The 49th (Hertfordshire–The Princess of Wales's) Regiment, after Princess Charlotte of Wales, daughter of the Prince Regent, later King George IV. The 49th served as marines at the Battle of Copenhagen on 2 April 1801. It was granted the Battle Honour Copenhagen in February 1819. The China Dragon was granted for service in China during the First Opium War (1839–42). On 1 July 1881, the 49th amalgamated with the 66th (Berkshire) Regiment to form The Princess Charlotte of Wales's (Berkshire Regiment). In 1885, the regiment was granted the Royal title in recognition of its service in the Sudan, and became The Princess Charlotte of Wales's (Royal Berkshire Regiment). In 1920, the name changed to The Royal Berkshire Regiment (Princess Charlotte of Wales's). In 1959, The Royal Berkshire Regiment (Princess Charlotte of Wales's) amalgamated with the Wiltshire Regiment (Duke of Edinburgh's), to form The Duke of Edinburgh's Royal Regiment (Berkshire and Wiltshire). Apr 1853 The 1st/49th arrived from Corfu. 13 Oct HQ company moved from the Auberge de Castille to the Auberge de Bavarie, with companies transferring from Fort San Salvatore, Fort St Angelo, and Fort Ricasoli to Fort Lower St Elmo Barracks. 2 Sep Pte William Harn 49th Foot aged 27 years. 29 Oct John Brind aged 1 year 10 months, son of Pte Richard Brind. 1 Jan 1854 Burial of Elizabeth Browne aged 1 year 10 months, daughter of Sgt Alexander Browne. 14 Feb In the Collegiate Church of St Paul's Valletta Bachelor Sgt Moses Rogers of Winchester in the County of Hampshire married Anne Williams, spinster also of Winchester. Mar The regiment marched from the Auberge Bavarie to Fort Ricasoli, and Lower St Elmo vice the 3rd (Buffs). It had 519 men fit for duty. 9 Apr The 1st/49th embarked on the transport Hope for Turkey. 11 Apr 130 men of the 1st/49th embarked on the transport Sultan for Turkey. It was present at Alma (1854), Inkerman (1854) and Sevastopol (1855). It moved to Barbados in 1857. Nov In November, the regiment had 18 officers and 678 men serving in the Crimea. Of the 201 admissions into the hospital, 107 were from gunshot wounds. The men had diarrhoea; there were 3 deaths from cholera. 4 Aug Sgt George Fennell 49th Regiment. 30 Sep Pte Edward Casey aged 18 years. 1 July 1881 The 49th Regiment became The 1st Battalion Princess Charlotte of Wales's (Berkshire Regiment). 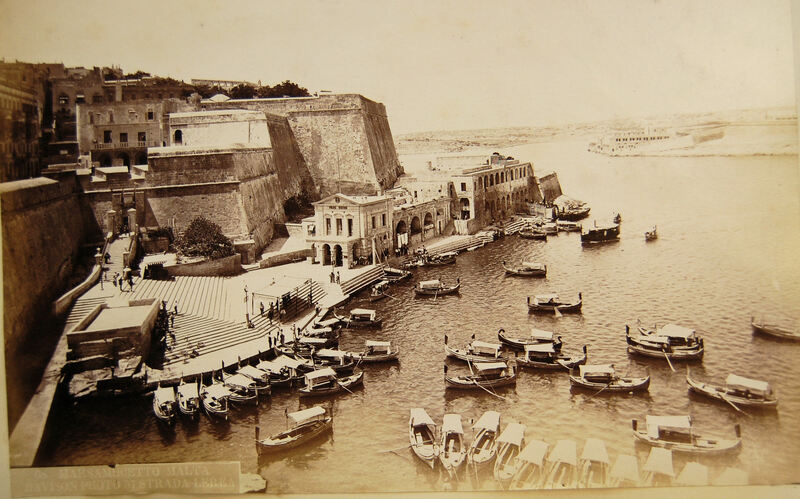 8 July 1882 The 1st/Royal Berkshire Regiment embarked at Gibraltar and disembarked in Malta on 18 July 1882. It deployed to Egypt on 23 July 1882. It returned to Gibraltar on 12 May 1883 but redeployed to Egypt on 21 August 1884. 25 May 1886 Half a battalion, (310 men), returned from Egypt (Suakin Expedition). It was stationed in Pembroke Camp for 7 months. The other half (4 coys) moved to Cyprus on 30 May 1886. The section in Malta had an average strength of 164 men. It had 89 admissions into hospital with no deaths. Its average constantly sick was 4.45. The average sick time to each soldier was 9.90 days. The average duration of cases of sickness was 18.25 days. The 1st/Royal Berkshire Regiment (half battalion) had an average strength of 397 men quartered at Fort Ricasoli. It had 152 admissions into hospital with 3 deaths. 3 invalids returned to England. Its average constantly sick was 12.12. The average sick time to each soldier was 11.14 days. The average duration of cases of sickness was 29.10 days. 15 May Arthur Herbert Ward son of Bridget and Cpl Edward David Ward of Fort Ricasoli, born on 27 Mar 1887. 9 June Ethel May Parmenter daughter of Mary and Sgt Henry Parmenter of Fort San Salvatore Cottonera, born on 22 Apr 1887. 3 Feb 1888 HQ Coy and half a battalion embarked at Cyprus and disembarked in Malta on 9 February. The battalion was quartered in Cottonera and Forrest Hospital. The 1st/Royal Berkshire Regiment had an average strength of 790 men (8 coys). It had 5 admissions into hospital with 4 deaths. 4 invalids returned to England. Its average constantly sick was 23.19. The average sick time to each soldier was 10.74 days. The average duration of cases of sickness was 23.90 days. 5 Sep Edith May Conner daughter of Maria and Sgt Thomas Conner, born on 20 Aug 1888. 14 Oct Martha Waldeck daughter of Sabina Ann and L/Sgt Albert Waldeck, born on 24 Sep 1888. 14 Oct Florence McCarthy daughter of Ellen and Pte Michael McCarthy, born on 15 Aug 1888. 26 Nov Joseph Brown son of Eliza and Sgt Maj Thomas Brown of Fort Ricasoli, born on 25 Nov 1888. 8 Dec Arthur Parmenter son of Mary and Sgt Henry Parmenter of Fort San Salvatore, born on 3 Nov 1888. The 1st/Royal Berkshire Regiment had an average strength of 857 men (8 coys). It had 361 admissions into hospital with 6 deaths. 10 invalids returned to England. Its average constantly sick was 23.41. The average sick time to each soldier was 9.97 days. The average duration of cases of sickness was 23.66 days. The battalion was at Fort Ricasoli for 7 and a half months and at Lower St Elmo Barracks for 4 and a half months. It had detachments at Pembroke Camp. Pte John Andrews drowned following an altercation with a boatman who had ferried him across the Grand Harbour to Fort Ricasoli. Subsequently, scuffles broke out between soldiers from the fort and the local inhabitants. 14 Apr Lilian Ward daughter of Bridget and Cpl David Ward, of Fort Salvatore, born on 21 Mar 1889. 25 Oct Frederick William Waldeck born 19 Sep 1889, son of Sabina Ann and Band L/Sgt Albert Waldeck. 20 Nov Florence Annie Jones born 27 Oct 1889, daughter of Annie and L/Sgt William Jones. 4 Dec Wilfred Henry Mark Parmenter born 29 Oct 1889, son of Mary and Sgt Henry Parmenter. 13 Aug Pte Francis James. 18 Aug Infant William Cripps aged 1 day, son of CSgt W Cripps. 9 Oct Pte Arthur Dicker, aged 23 years. 25 Nov Pte John Cofton, aged 29 years. The 1st/Royal Berkshire Regiment had an average strength of 875 men. It had 374 admissions (427.4/1000 mean strength) into hospital with 4 deaths (4.57/1000 mean strength). 16 invalids returned to England. Its average constantly sick was 25.89 (29.59/1000 mean strength). The average sick time to each soldier was 10.80 days. The average duration of cases of sickness was 25.27 days. The battalion was at Marsamxetto Barracks and Lower St Elmo Barracks for 12 months with detachments at Pembroke Camp for 9 months. 10 Dec Kate Waldeck born 16 Nov 1890, daughter of Sabina Anne and L/Sg Albert Waldeck. 6 Aug Infant William F Waldeck aged 10 months, son of Sgt Waldeck. 11 Aug Infant Elizabeth C Bell aged 7 months, daughter of Sgt Bell. 20 Aug Infant Flores Annie Jones aged 10 months, daughter of Sgt Jones. 13 Oct Pte Frank Clarke aged 22 years. 5 Nov Child Victoria Jubilee Waldeck aged 3 years. 25 Nov Cpl Frederick Tyson aged 22 years. 19 Dec Pte E Turner aged 24 years 11 months. 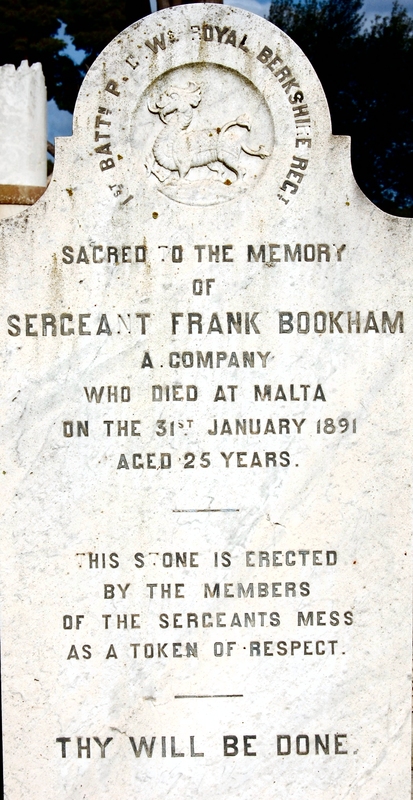 Sgt Frank Bookham A Coy died 31 Jan 1891 aged 25 yrs. 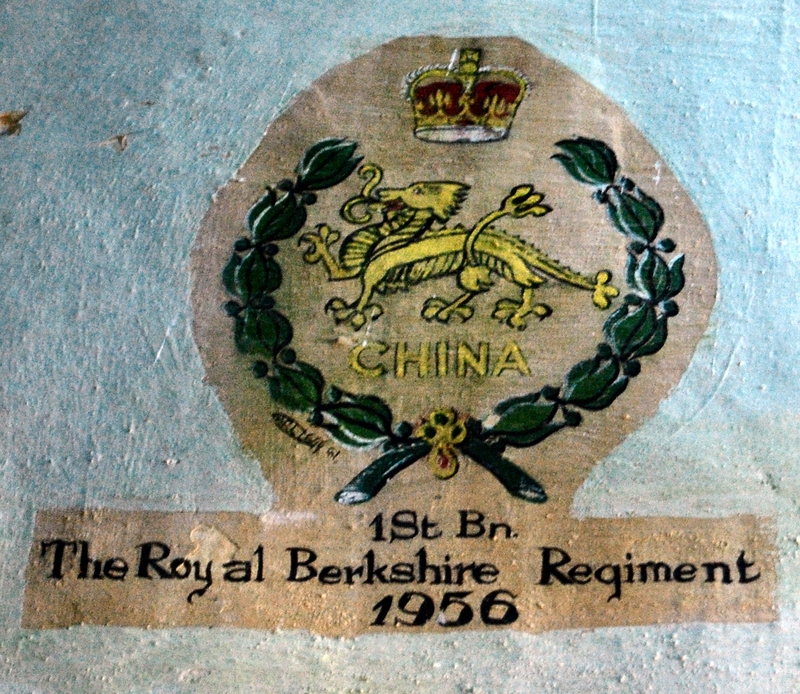 The 1st/Royal Berkshire Regiment had an average strength of 995 men. It had 678 admissions (681.4/1000 mean strength) into hospital with 7 deaths (7.03/1000 mean strength). 20 invalids returned to England. Its average constantly sick was 44.67 (44.80/1000 mean strength). The average sick time to each soldier was 16.30 days. The average duration of cases of sickness was 24.05 days. The battalion was quartered at Marsamxetto Barracks and Lower St Elmo Barracks for 12 months. 18 Jan Alice Hilda Brown born 5 Dec 1890, daughter of Eliza Manwela and Sgt Maj Tom Brown. 17 May Alice Maud Claydon born 27 April 1891, daughter of Elizabeth and Sgt Samuel Claydon. 10 July Thomas William Walten born 27 June 1891, son of Rose and Sgt William Walten. 15 July Beatrice Harriett Ingram born 28 June 1891, daughter of Ellen and School Master Walter Ingram. 30 Jan Pte W Jackson aged 28 years. 14 Feb Pte F Buckland aged 28 years. 8 Aug Mrs Elizabeth Claydon aged 26 years wife of Sgt Claydon. 18 Aug T Bicknell aged 20 years. 22 Sep F Griffiths aged 19 years died at Cottonera and was buried in Rinella Military Cemetery. Sep Infant A Claydon aged 4 months. 8 Oct Pte H Hunt aged 21 years. 30 Dec Ernest Lovelock aged 25 years. 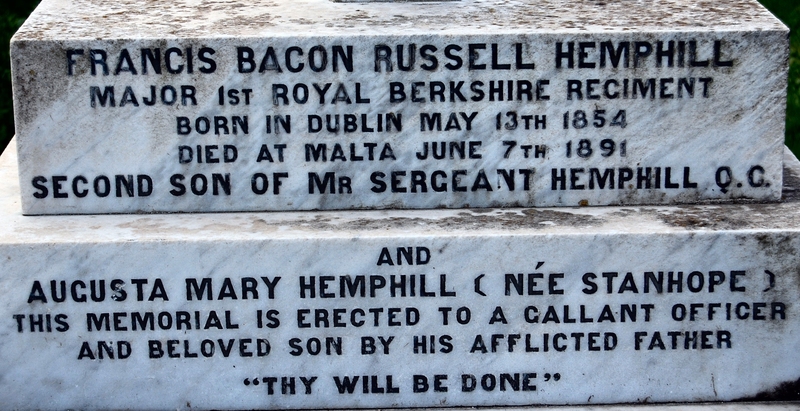 Major Francis Bacon Russell Hemphill born Dublin 13 May 1854 died 7 June 1891. He was the son of Mr Sergeant Hemphil QC and Augusta Mary Hemphill nee Stanhope. The 1st/Royal Berkshire Regiment had an average strength of 1004 men. It had 540 admissions (546.8/1000 mean strength) into hospital with 11 deaths (10.96/1000 mean strength). 9 invalids returned to England. Its average constantly sick was 37.17 (37.02/1000 mean strength). The average sick time to each soldier was 13.55 days. The average duration of cases of sickness was 25.78 days. The 1st/Royal Berkshire Regiment was quartered at Lower St Elmo Barracks for 12 months. It had detachments at Fort Mosta and Fort St Angelo. 11 May Jessie Malcolm Jacob born 23 Apr 1892, daughter of Annie and Armourer Sgt Mark Francis Jacob of Valletta. 27 July Alice Waldeck born 23 Mar 1892, daughter of Sabina and Sgt Albert Waldeck of Valletta. 12 Oct Ernest Alfred Peter Chapman born 11 Sep 1892, son of Clara and CSgt John Chapman of Valletta. 20 Nov A West aged 26 years, died at Cottonera. 10 Dec Ernest Alfred Chapman aged 3 months, died at Fort St Angelo. 22 Dec C Marsh aged 26 years, died at Fort St Angelo. 27 Dec C Christell aged 24 years, died at Fort St Angelo. 31 Dec G H Martin aged 24 years, died at Verdala Barracks. 19 Jan F Buchett aged 26 years. 31 Mar Hannah Bellerby aged 6 months, daughter of Sgt G F Bellerby. 23 Aug J Johnson aged 22 years. 1 Sep L/Cpl F Dixon aged 23 years. 25 Nov Child Thomas Walton aged 1 year 5 months, son of Cpl Walton. 26 Nov W Payne aged 27 years. 19 Dec W Howard aged 24 years. The 1st/Royal Berkshire Regiment had an average strength of 173 men. It had 141 admissions into hospital with 9 deaths. 9 invalids returned to England. Its average constantly sick was 13.70. The average sick time to each soldier was 28.00 days. The average duration of cases of sickness was 35.46 days. 4 Mar 1893 The 1st/Royal Berkshire Regiment was quartered at Lower St Elmo Barracks for 2 months. It embarked for Bermuda where it arrived on 19 March 1893. It proceeded to Nova Scotia on 2 December 1895. 12 Feb William Edward Macarthy born 25 Jan 1893, son of Helen and Pte Michael Macarthy of Lower St Elmo Barracks Valletta. 12 Feb Charlotte Walten born 2 Feb 1893, daughter of Rose and Cpl William Walten. 2 Jan T Ball aged 34 years. 12 Jan W Painting aged 22 years. 15 Jan T Guy aged 23 years. 16 Jan W Whipp aged 23 years. 26 Jan W Smith aged 22 years. 5 Feb J Hinton aged 26 years. 12 Feb George Coyens aged 22 years. 28 Feb F Bishop aged 23 years. Aug 1956 The 1st/The Royal Berkshire Regiment arrived from England but left for Nicosia, Cyprus in October.